The principle is quite simple: each team fights a battle against the over, with the help of a fake but flashy weapon. Each participant has a fake weapon, equipped with a laser beam. The game takes place in a 700 square meter labyrinth specially built for the laser tag game. The game field is voluntarily shaded by smoke, lack of light, and mirrors and traps on two floors. Music is also played during the game to motivate players. The aim of the game is to score points by touching captors of other players, with the help of laser beam weapons. It’s a computer in charge of detecting the shots, and then counts them. When a player is hit, his weapon is deactivated for a few seconds, and he loses points. At the end of the game, it’s the team of players who scored the most points that wins. Laser game laser tag is a game with mystery and it’s also quite sporty. Each player proves to be agile and discreet to help his team win. It’s a team game. Laser tag was born at the end of the 70s. It was the time when the American army had designed laser beam weapons for its training centers. The first models of laser beam weapons were used during the filming of Star Trek in 1979: “the electronic phaser gun”. But, at the time, players that were reached by the beam were not deactivated. So, the game didn’t offer any score like the games do today. It is however considered by many to be the father of the laser tag industry. Then, in 1982, Georges Carter III built the point count system, in a game arena. He opened his first center in Dallas in 1984. In 1999, the first big arena was opened in Arizona. 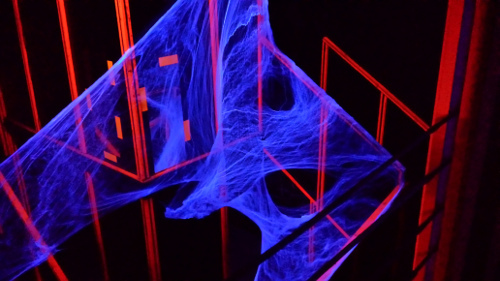 Laser game is based on a new technology associating a red laser beam and radio waves. This technology is more accurate than “lumiere infrarouge” and it allows to cover a larger range. The equipment encompasses a plastic jacket that suits all shapes, captors and light “émetteurs”. At the front of the jacket, there is a gun that shoots a red laser beam. The top of the gun is covered by a lamp, that helps you find your way in the dark. The game also includes two mines, that can be activated by shooting at it. These mines allow you to get special powers, such as the option to change teams, to play invisible, or to obtain the laser machine gun.